Did you know that you can go all the way from Canada down to Key West, Florida with your boat as the only means of transportation? 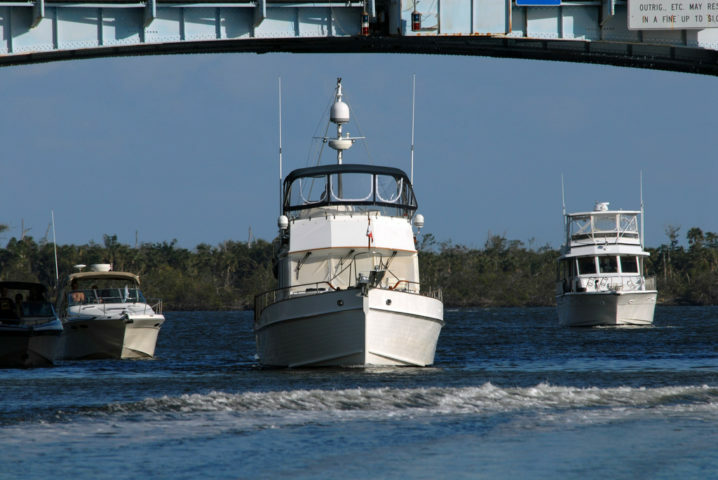 The Atlantic Intracoastal Waterway is a highway of sorts for smaller boats. 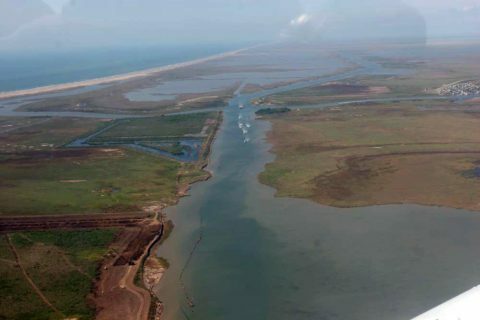 Avoiding the dangers of the open ocean, you can travel this system of canals, rivers, and protected waters up and down the East Coast in safety and comfort! And if that’s not far enough for you, the Intercoastal Waterway system also extends from Florida on the Gulf side all the way around to Brownsville, Texas. Authorized by Congress in 1919, the Intracoastal Waterway system is maintained by the Army Corps of Engineers. Many portions of the system experience heavy commercial traffic (as barges move around the country), but the system also provides a safe route for pleasure boaters who are looking to avoid possible rough seas in the open Atlantic Ocean. While I was living in Elizabeth City, North Carolina as I traveled north toward Norfolk Virginia the highway ran parallel to a part of the waterway that runs through the Great Dismal Swamp. Peeking through the thick woods, it would be almost startling to see a 50-foot luxury yacht motoring along just a few feet away — especially since you couldn’t see the canal from the road while driving. This portion of the Intercoastal Waterway was dug through the Great Dismal Swamp with only hand labor. Both George Washington and Patrick Henry were greatly involved in the creation of the waterway through that area, as they had logging interests in the Dismal Swamp. 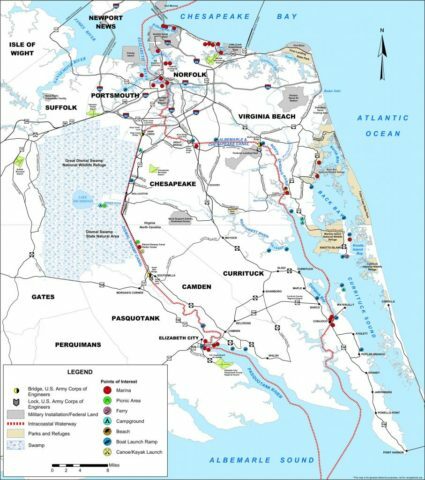 Traveling the Atlantic Intracoastal Waterway requires a good knowledge of all the various parts of the system. Not all of it is narrow channels that are well-marked pointing the way. Much of it is skirting open ocean as it hugs the coastline between inland sections. Reed’s Nautical Almanac is one publication that can guide you over the full length of the system. You can stay abreast of improvements, repairs and other news by becoming a member of the Atlantic Intracoastal Waterway Association. Whenever Congress makes decisions affecting the waterway, you’ll be among the first to know! If you’re up to the challenge, you can always do the Circle Route (or America’s Great Loop) — which includes the Intercoastal Waterway, plus a trip up the Mississippi then following the Great Lakes back out to the East Coast. This Great Circle Route Guide will help you make plans for this ultimate American Voyage! The beauty of traveling the Atlantic Intracoastal Waterway is the fact that a large cruiser isn’t required. Many modest sized boats make the journey quite comfortably. The most important ingredient is time. With an open calendar, you can enjoy your voyage along the Intercoastal Waterway as it should be taken — slow and relaxed! There are plenty of wonderful stops along the way, which will enable you to experience the different cuisine, including Maine lobster, fresh Chesapeake Bay blue crabs and oysters, maybe even some New Orleans crawfish or gumbo. After all, a man’s got to eat! In addition to the beautiful scenery and the relaxing journey, cruising the Intracoastal Waterway is a great opportunity to try some new foods when you’re traveling. Here’s an Intercoastal Waterway map with a list of marinas, plus the official NOAA Intracoastal Waterway maps and charts.